Sam Winnall's two fine goals helped an impressive Derby County move up to second place in the Championship. The on-loan Sheffield Wednesday forward headed the Rams in front early on and added a stunning 25-yard shot into the top corner soon after the break. Tom Lawrence had a long-range effort to make it 3-0 that went over the bar. The Rams had a host of chances to add to their lead before Joe Garner pulled one back for Town as he headed home a Martyn Waghorn corner. Derby, who have now won seven of their last nine matches, will stay in the promotion places unless Bristol City can beat runaway Championship leaders Wolves in Saturday's 17:30 GMT game at Ashton Gate. Gary Rowett's Rams were impressive in the first half as Matej Vydra had two excellent chances and Bartosz Bialkowski saved well from Winnall, while Town had a Callum Connolly effort cleared off the line. It was a similar story in the second half as the Rams showed their promotion credentials before Garner's goal. 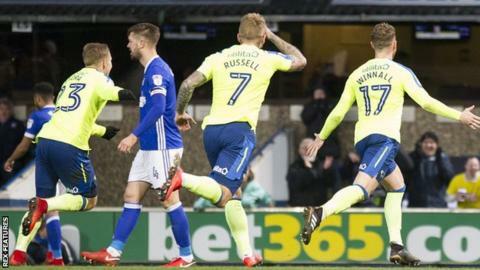 It was the first time County had conceded in five games - Ipswich's 1-0 win at Pride Park on 28 November the last time Derby's goal was breached. "We were beaten by a better team, a considerably better team on the day. "They have been very expensively assembled prior to Gary getting there and he is now getting the best out of them. "He is a good manager as he proved at Birmingham and they were too much for us in the first half and they could have been out of sight." "It's a difficult place to come and they put you under a lot of pressure with the way that they play. "They have got a real energetic side and I felt first half we blew them away with some really good attacking play. "Our front four were unplayable at times and in my opinion we really should have been out of sight." Match ends, Ipswich Town 1, Derby County 2. Second Half ends, Ipswich Town 1, Derby County 2. Attempt blocked. Andreas Weimann (Derby County) left footed shot from the left side of the box is blocked. Assisted by George Thorne. Foul by David McGoldrick (Ipswich Town). Attempt missed. Jonas Knudsen (Ipswich Town) header from the left side of the six yard box is close, but misses to the left. David McGoldrick (Ipswich Town) wins a free kick on the left wing. Substitution, Derby County. Chris Baird replaces Sam Winnall. Attempt blocked. Grant Ward (Ipswich Town) right footed shot from the centre of the box is blocked. Corner, Ipswich Town. Conceded by Craig Forsyth. Attempt missed. Grant Ward (Ipswich Town) right footed shot from outside the box is high and wide to the left. Substitution, Derby County. Marcus Olsson replaces Matej Vydra. Jonas Knudsen (Ipswich Town) wins a free kick on the left wing. Offside, Derby County. Tom Huddlestone tries a through ball, but Sam Winnall is caught offside. Foul by Sam Winnall (Derby County). Substitution, Ipswich Town. Dominic Iorfa replaces Adam Webster because of an injury. Delay in match Adam Webster (Ipswich Town) because of an injury. Attempt missed. David McGoldrick (Ipswich Town) header from the right side of the six yard box misses to the left. Assisted by Martyn Waghorn with a cross following a corner. Offside, Ipswich Town. Martyn Waghorn tries a through ball, but Joe Garner is caught offside. Substitution, Ipswich Town. David McGoldrick replaces Kevin Bru. Substitution, Derby County. Andreas Weimann replaces Tom Lawrence. Sam Winnall (Derby County) wins a free kick in the defensive half. Foul by Callum Connolly (Ipswich Town). Corner, Ipswich Town. Conceded by Andre Wisdom. Attempt blocked. Jonas Knudsen (Ipswich Town) right footed shot from the left side of the box is blocked. Assisted by Joe Garner. Attempt saved. Tom Lawrence (Derby County) right footed shot from the centre of the box is saved in the bottom right corner. Assisted by Sam Winnall with a through ball. Tom Lawrence (Derby County) wins a free kick on the left wing. Goal! Ipswich Town 1, Derby County 2. Joe Garner (Ipswich Town) header from very close range to the top right corner. Assisted by Martyn Waghorn with a cross following a corner. Corner, Ipswich Town. Conceded by Tom Lawrence. Corner, Ipswich Town. Conceded by Curtis Davies. Attempt missed. Kevin Bru (Ipswich Town) header from the centre of the box is close, but misses to the left. Assisted by Grant Ward with a cross.